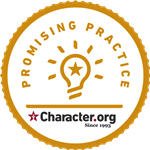 OKcharacter.org is a non-profit organization that helps schools throughout Oklahoma implement best practices for character education. We do this by providing training in the 11 Principles of Effective Character Education developed by Character.org and by assisting schools in evaluating their culture and climate as they take steps toward becoming State and National Schools of Character. Many problems facing schools and society stem from a lack of good character. In constrast, when students develop positive ﻿character qualities such as responsibility, honesty, diligence, respect, courage, compassion, citizenship, and service, it naturally leads to better schools, stronger families, and safer communities. Bullying plays a part in 67% of school shootings.